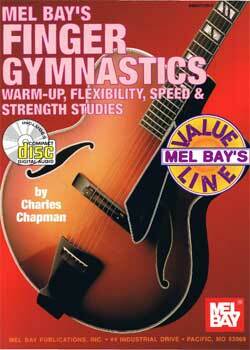 Charles Chapman Finger Gymnastics PDF + Mp3 CD download. Warm-Up, Flexibility, Speed and Strength. This book is for all levels and styles of guitarists. “Finger Gymnastics” is a term used for warm-ups, stretching, and any type of practice exercise that develops technique and stamina while preventing technique related injuries. The exercises in this book are time-tested and will keep your technique at its optimum while helping to ensure injury-free performance. The enclosed CD presents three versions of the exercises in chapters I and II, each version more advanced than the preceding one. In chapter III, bass and rhythm accompaniments are included for many of the examples. Matching the pitch and articulation with a rhythm background will not only assist in warming up, stretching, and building stamina, but will make your practice a more pleasurable experience. The exercises are not long but not too short. They get the job done in loosening those muscles up. Download Charles Chapman – Finger Gymnastics PDF free and other books from our site. Only high quality PDF scans. Please write a review, it's important for our community.